In 1882, Thomas Edison built the Pearl Street Station, his first steam powered electrical distribution plant. In the years that followed, intense competition broke out between he and George Westinghouse, which became known as the War of the Currents, and the technology improved markedly in the coming decades. As Robert Gordon pointed out in The Rise and Fall of American Growth, by 1940 life had been fully transformed. Even middle class homes had most of the modern conveniences we enjoy today, including refrigerators, air conditioners, telephones and radios. Soon, they would have TV’s as well. Today, we’re going through a similar revolution. Just as electric light became competitive with gas light more than a century ago, renewable energy and electric cars are becoming competitive with technologies based on fossil fuels. Yet for the new technologies to become truly transformative, we need to develop a new generation of batteries to power them. In The Powerhouse, author Steve Levine explains how when John Goodenough discovered the principles of lithium-ion batteries in 1979, it was little more than an academic curiosity and hardly anyone took notice. By the early 1990’s though, improved microchips created demand for more powerful portable devices and Sony developed a commercial version. 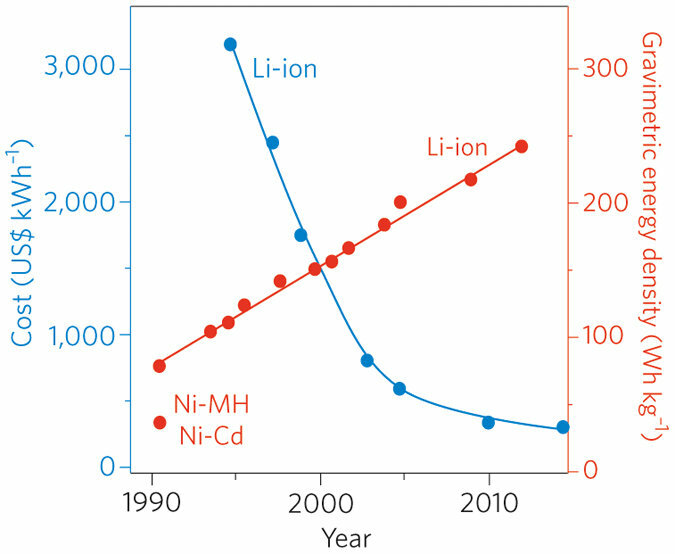 Since then, as researchers from the Joint Center for Energy Storage Research (JCESR) point out in a paper explaining the issues surrounding energy storage, Lithium ion technology has improved enormously. This has lead energy densities to improve on earlier technologies by a factor of six and costs to drop by a factor of 10. Today, Lithium ion batteries are doing far more than simply power laptops and smartphones. They are being used in high performance cars like the Tesla Model S and the Chevy Bolt. They are also being deployed to overcome the intermittency of renewable energy sources like solar and wind and to replace inefficient peaker plants that run only in times of high demand. Still, while there has been enormous progress, Lithium ion batteries are too expensive to displace conventional technologies such as gasoline engines for cars and gas turbines for electricity. Prices need to fall by an additional 50%-80% to be economically compelling for cars and the grid. However, there are some difficulties. First, the process of intercalation causes the battery’s components to degrade as it charges and discharges. Second, due to its basic chemistry, there is only so much Lithium you can get to fit in between carbon atoms in the anode and cathode, so there is an upper limit to how much energy density you can achieve. So now, battery technology, much like Moore’s law in information technology, is approaching its theoretical maximum performance. Crabtree predicts that it we might be able to get 50% to 100% better performance, but certainly no more than that. To create a true energy transformation, we will have to deploy new technological strategies. The final strategy is to use liquid flow batteries. These tend to be heavier and larger, so are less suitable for car batteries, but have tremendous potential to provide utility-scale grid storage that can help make renewable energy practical and affordable. While they may not improve energy density, early indications are that flow batteries can lower costs enormously. It’s been over 150 years since Alessandro Volta built the first battery, so any significant improvement will test the bounds of human knowledge. As Eric Rohlfing, a Deputy Director at ARPA-e told me, “Folks like Tesla and others are pushing the boundaries, but we know there are limits to Lithium ion.” So we need to think differently about innovation to create a serious impact. One new strategy is Rohlfing’s agency itself, which he says “supports ideas in the high risk, high return ideas in the concept stage and push them to where they can attract further funding.” So far, it’s been an enormous success, attracting $1.25 billion in private follow-on funding, nearly five times the agency’s annual budget of about $280 million. Another novel approach is Crabtree’s JCESR, which combines the efforts of researchers from government labs, academic research institutions as well as private companies. It aims to not only accelerate the discovery of new batteries, but their commercialization as well. “Our aim is to create something transformative, not merely competitive,” he says. And so, we might very well be at a similar point that were were in 1882, when Thomas Edison opened his first power station. It’s doubtful that anyone could have predicted what it would lead to, but it touched off nearly a century of unprecedented productivity growth. With a little luck, history might repeat itself.